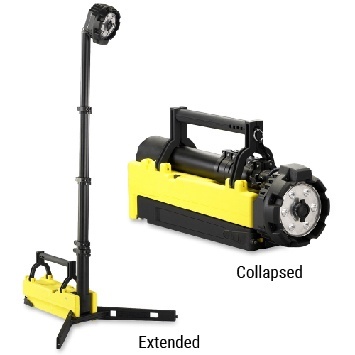 The Portable Scene Light is an industrial-duty, rechargeable, completely portable high lumen flood light that can be fully deployed in less than 30 seconds. 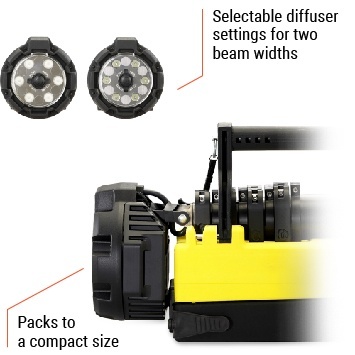 The Portable Scene Light uses six (6) LEDs and wide pattern reflectors to produce a uniform flood pattern with two (2) selectable beam widths and three (3) light output intensities. 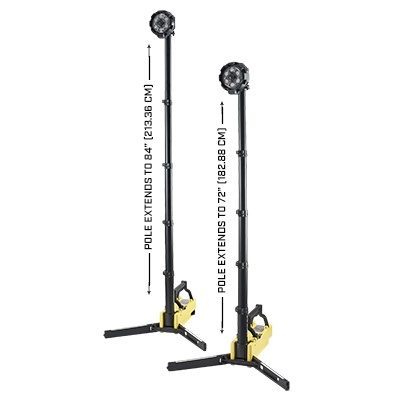 The Portable Scene Light’s telescoping pole and rotating head extend to an overall height of 72 inches, or 84 inches for the EXT version. 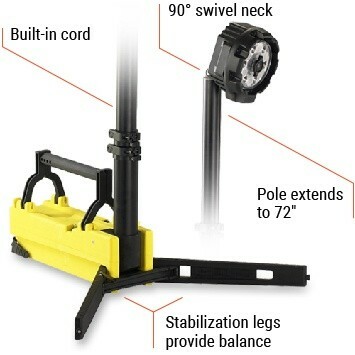 On-board stabilizing legs can be deployed for high wind or uneven terrain environments. 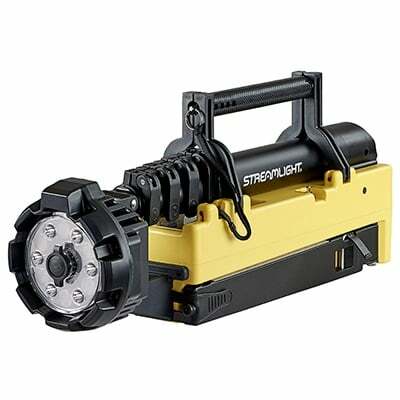 Ideal for field maintenance, inspection of construction sites and remote equipment, military operations and general scene lighting. System ships with a heavy duty shoulder strap, AC charger and 12VDC cord. High-impact thermoplastic housing, sealed. Available in International Safety Yellow. 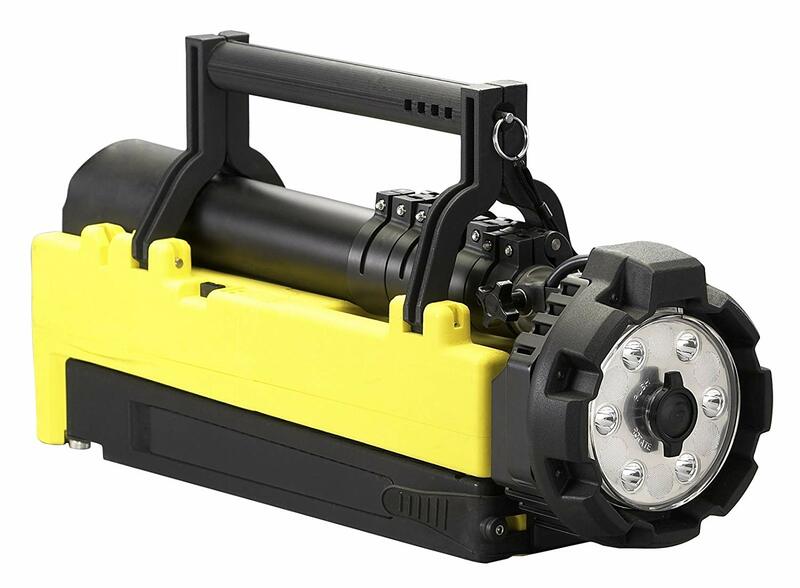 Portable Scene Light: 25 lbs (11.3 kg) with batteries (included in purchase). 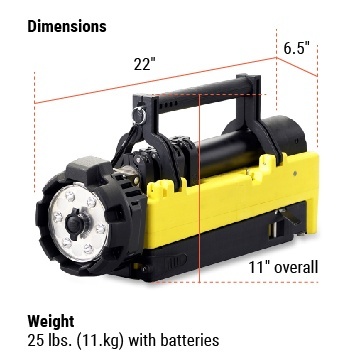 Portable Scene Light EXT: 25.5 lbs (11.6 kg) with batteries (included in purchase). LENS:Unbreakable polycarbonate with scratch-resistant coating. O-ring sealed. Six (6) wide pattern parabolic reflectors produce a smooth pattern. Selectable diffuser setting for two (2) beam widths. Optimized electronics provide fully regulated intensity; three (3) selectable light output intensities. Toggle switch allows operation from internal battery or continuous operation from external 12VDC or AC power source. RUN TIME: See chart for battery operated run time. All run time claims to 10% output level. Red low battery warning indicator. All models include an AC power supply and 10 foot 12VDC power cord for continuous operation while simultaneously charging batteries. Zero-maintenance 12V, 14.4 Ah sealed lead acid battery rechargeable up to 500 times. Red and green LEDs provide charge status feedback. 10 hour charge to 90% battery capacity with continuous trickle charge to maximize battery capacity. 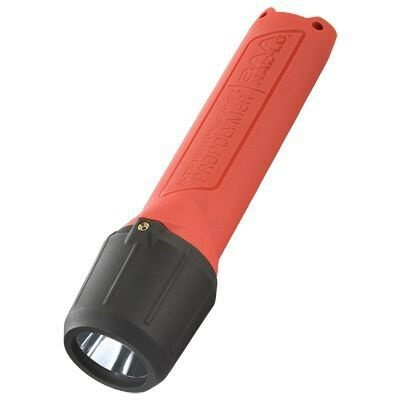 Scene Light battery will continue to charge while operating directly from an external power source when using the 12VDC cord or AC charger.